One of the most controversial flowers in the world of floristry is the lily. It is impossible to remain indifferent to lilies - you either love them, or do not tolerate the spirit, there is no intermediate feeling. Nevertheless, it was this flower that became the embodiment of purity and innocence among many cultures and peoples. In this article, the flower delivery service in Kiev will share with you historical facts and beautiful legends about beautiful lilies. 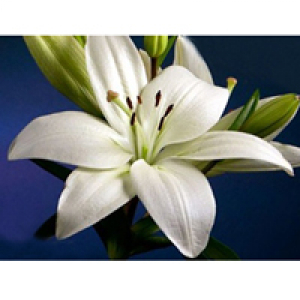 In medieval Germany, the lily was considered a flower of the afterlife and a mourning state. According to legend, the lily is a symbol of the redemption of sins. It is believed that if a lily grows on a grave, the person buried under it is innocently convicted. A beautiful legend of the Germans tells of the belief that along with every flower of the lily there is an elf, who with it is born and dies. In the daytime, the elves dutifully sleep inside the flower, and at night they start to loosen the high stem with the flower slightly. Rocking, the lily begins to ring, thereby helping the elves to utter a magical prayer. After this magical process, the elves return to their flower beds and sleep soundly until the next wonderful night. With the era of gloomy Middle Ages and the ominous inquisitions, the lily suddenly turned into a flower of shame. The Catholic church began to use this flower in the massive burning of "sinners" at the stake. It is still difficult to explain why a beautiful flower suddenly became a symbol of obscurantism and abuse of people. The most terrible criminals were branded with the image of a lily. In Rus in the era of Christianity the white lily was considered a symbol of purity and purity, in connection with which this flower became an invariable gift for the bride on the day of her wedding. Another symbolism of the lily is its embodiment with the flower of the world. Cultivate the same lily became only under the reign of Peter I. In the modern world, lilies are found literally in any flower shop. This flower is widely used in wedding floristry, in the creation of floral compositions and bouquets, even when creating toys from flowers. It is worth noting the special role played by the lily in the history of France. When the French defeated the Germans near the Lee River, where lilies grew, the winners returned home in wreaths of lilies. Since then, the lily was considered the embodiment of virtue and justice, it was decorated with arms and a banner. In those distant times, France became a kingdom of lilies, and the above-mentioned flower became a welcome guest of every garden and park. The modern lily - what is it? To date, the world of floristry knows more than 3000 varieties of lilies. At the same time, the number of new hybrid varieties of this flower is increasing every year. The most beautiful variety is the Ladenburg lily. A beautiful legend says that during the appearance of this flower to the light, all other plants bowed their heads before it, the trees rustled with leaves, and the air was filled with a delicate and delicate aroma. With a drop of dew inside the flower, the lily looked like a pearl. The most valuable and in-demand variety of lilies, and in this regard - very rare, is the royal lily. Its homeland is China, Sichuan Province, where among the mountains the lost narrow valley gives the world beautiful flowers. In 1903 an English botanist wandered into these lands and opened the world a beautiful plant with a large white flower. From this province, the bulbs of the royal lily were brought to the expanses of England, and from there they began to spread to all corners of the globe. To this day, lily is considered a popular flower in the world of floristry and finds application in various spheres of human life. In addition to its decorative and aesthetic properties, lily is used in cosmetology, cooking and medicine.